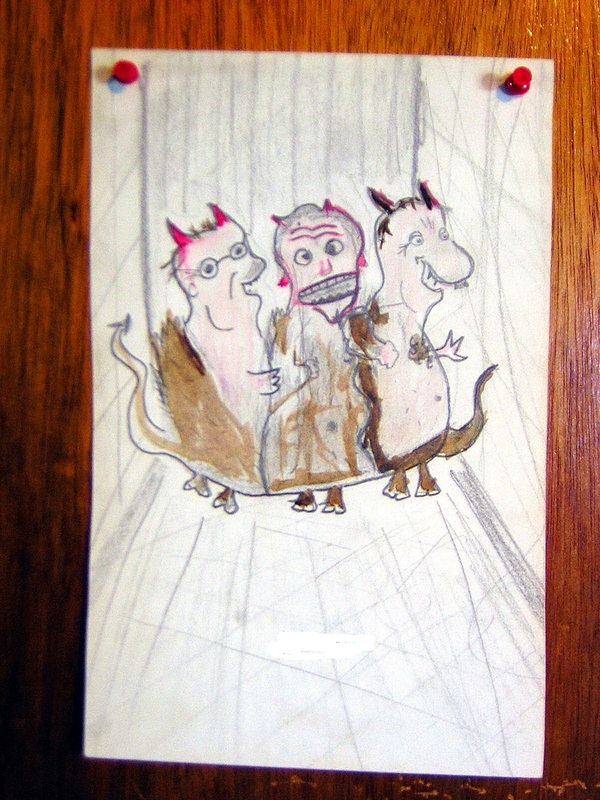 “3 devil morning” – by amyeighttrack, pencil & watercolor, 1982. This drawing came straight out of my subconscious. It is somewhat the product of being hung over and shamed. It’s a very scary combination – not a muse I would recommend. Still… this is one of my favorite drawings ever! So what’s the lesson, in terms of ‘the muse’? I would say: find a way to tap into the subconscious (sans alcohol/other ‘substances’) in an uninhibited, free-flowing way. Maybe it’s about learning to trust yourself; your instincts, your point of view. Find a way to draw because you have to draw. Let it be your ‘diary’ or journal. 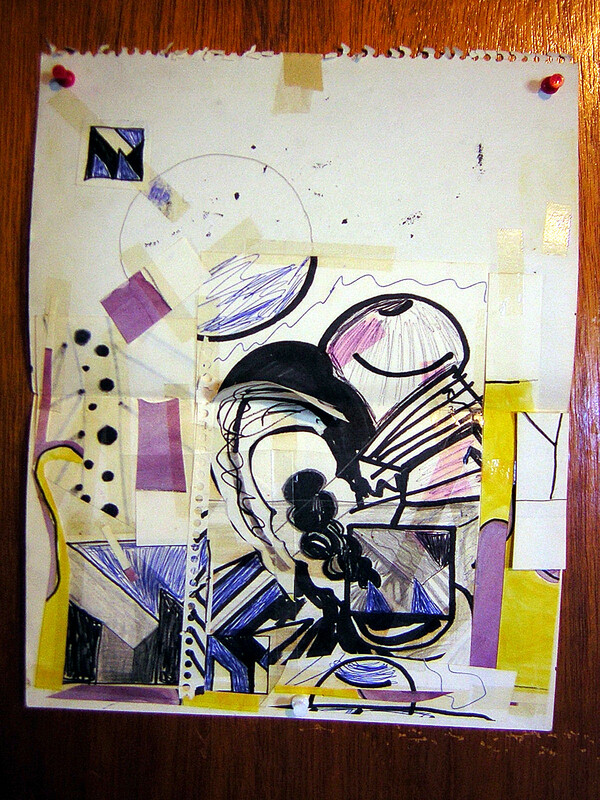 “design exercise – collage”, early ’80’s. Inspired by an art class design exercise. I think I tried to develop some design ideas; then chopped up and combined some of them with random stuff. 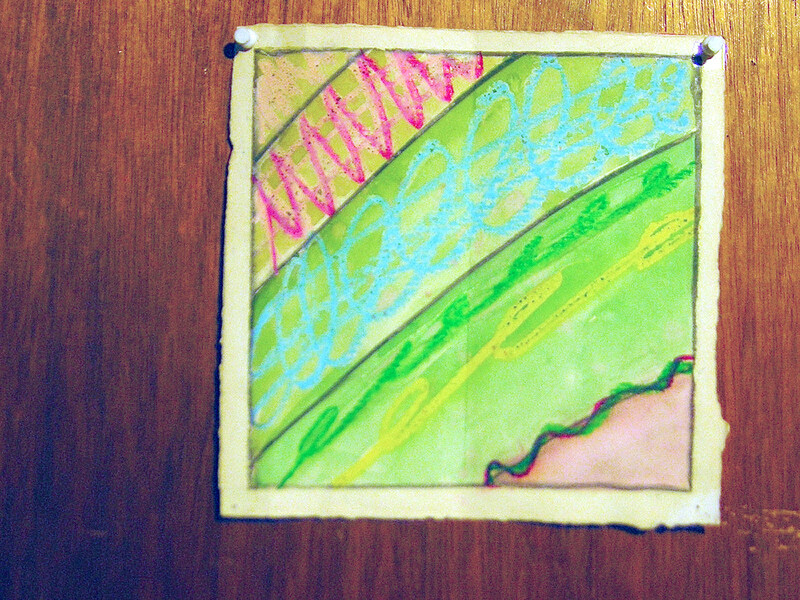 “nuclear” – pencil, felt pen, watercolor, 80’s. 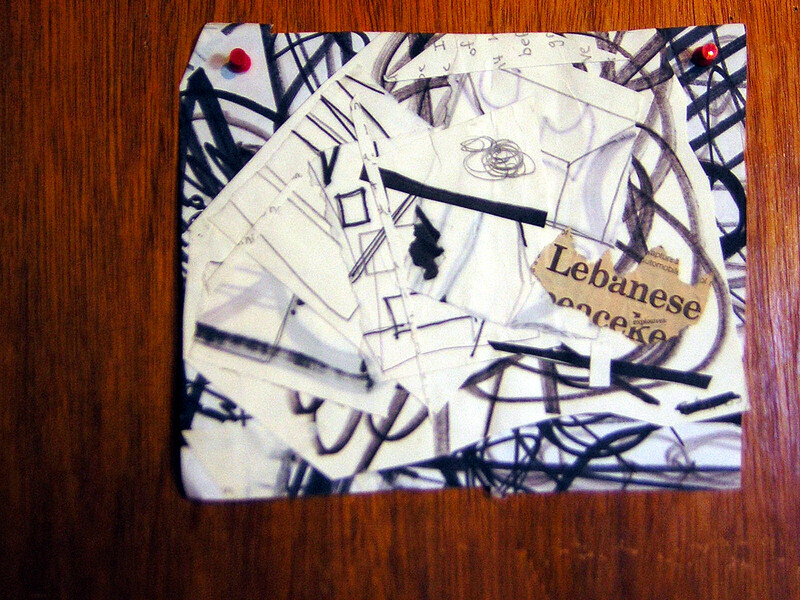 I think it was inspired by my art class design exercise and collage work. 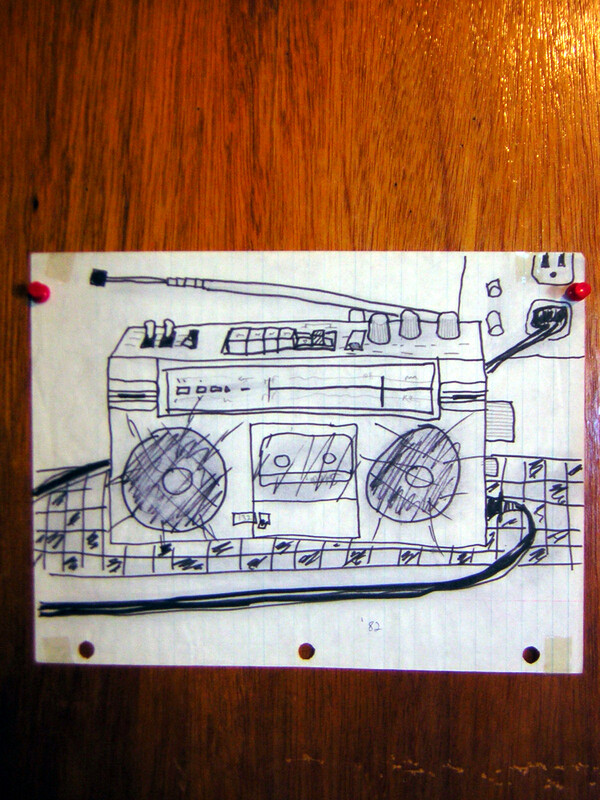 “cassette player on ship cabin desk w/ checked tablecloth” – pencil and felt pen. Straight from the subconscious – I probably wanted to express how much music meant to me as a merchant mariner. It was like a splash of color on a grey, endless horizon; it made one feel a bit less isolated. It was a social thing, too; a broadening experience – sharing music. 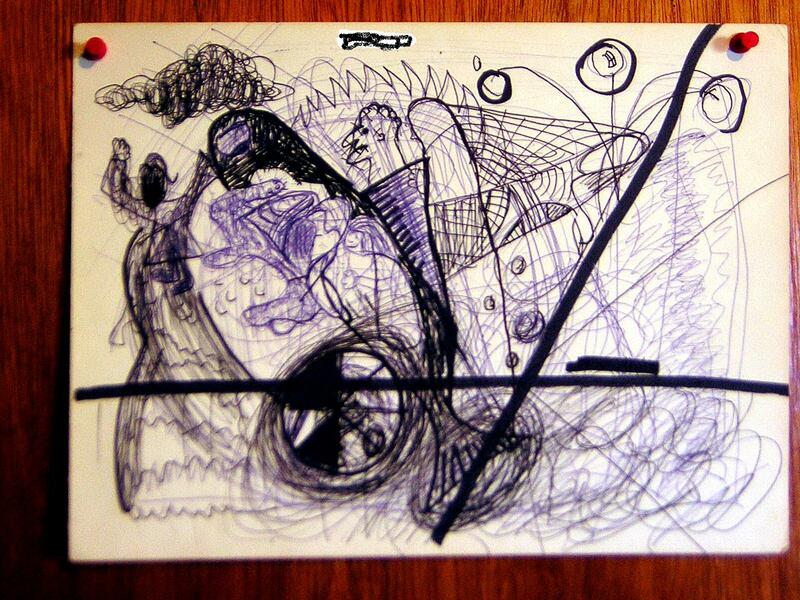 “russian submarine bird” – ballpoint and felt tip pens, 80’s. Click on photo to see detail. Just doodles. I wish I still had that ability to just tap into/go into my subconscious. Or maybe I decided I didn’t like what I saw there. “killer whale pod” – ballpoint and felt tip pens, 80’s. Doodles, as above. 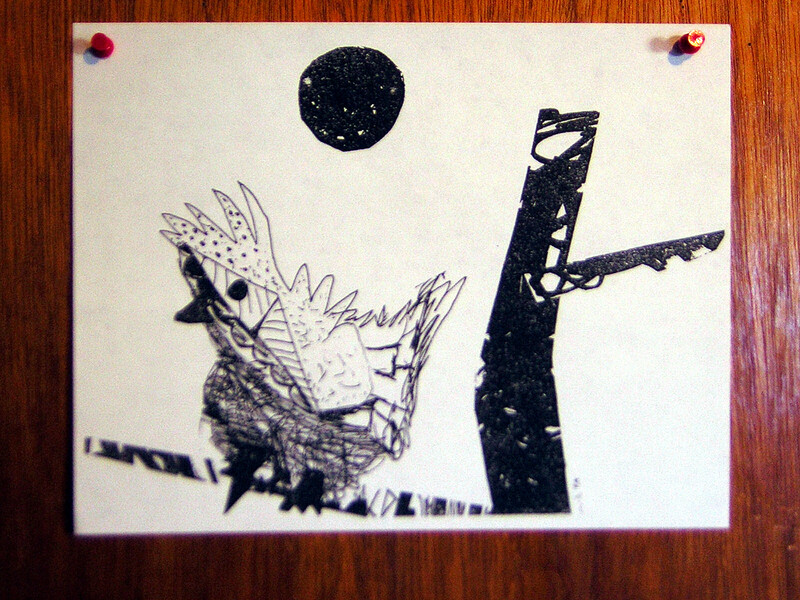 “lonesome bird that looks like me” – xerox of original – collage, felt tip pen, c. 1984. Another doodle. Existentially lonely and kept company by a little bird outside my window that told me I’d be okay. Well, anyway – birds seems to resonate to something essential, within my life. 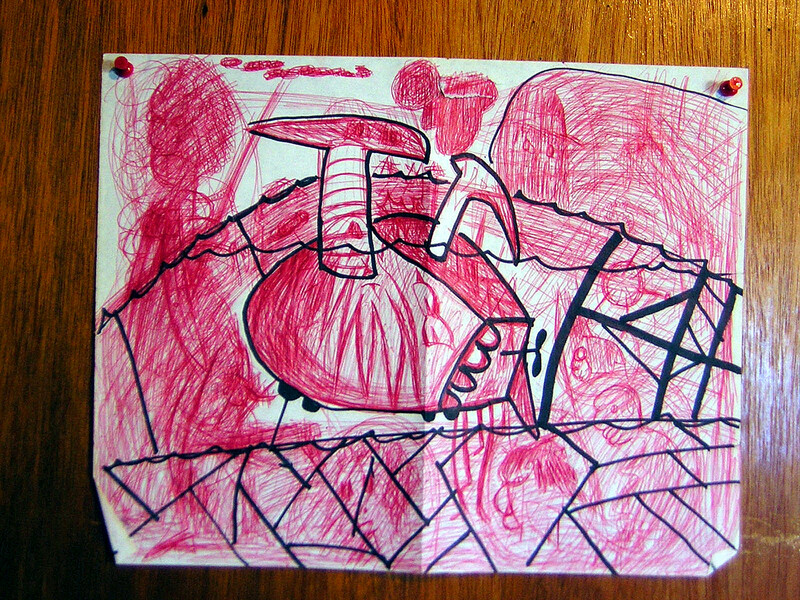 This drawing may have been one of the first manifestations of that. 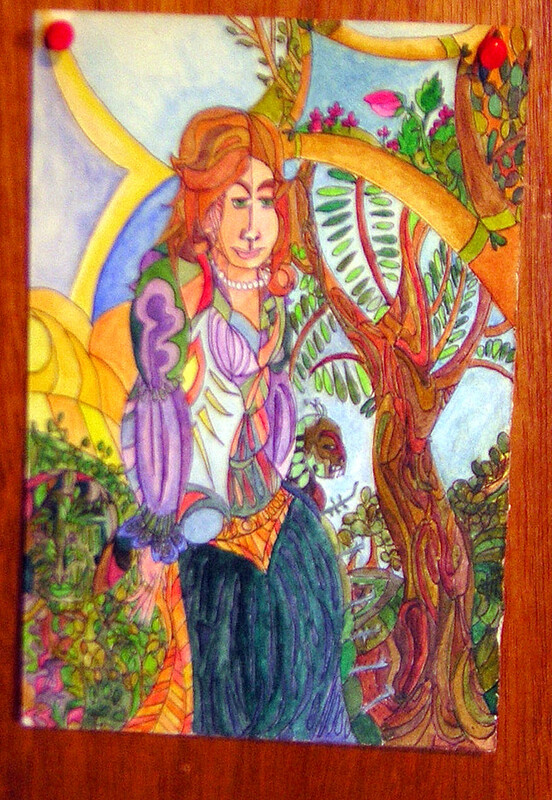 “scribbles” – pencil, crayon and watercolor. c. 1979. My mother and an artist friend were doing a whole bunch of these and invited me to try. I like the simplicity of the technique and its possibilities for spontaneous expression. 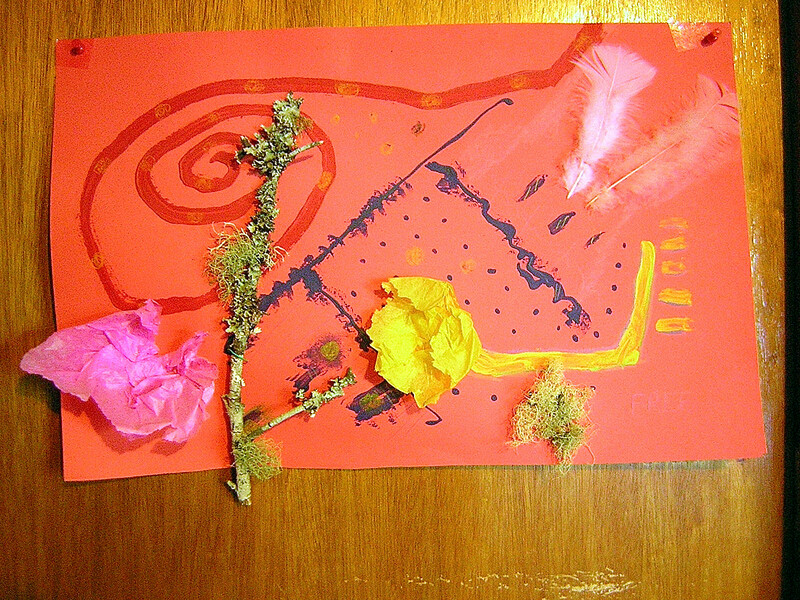 See watercolor and crayon art at Google Images here . 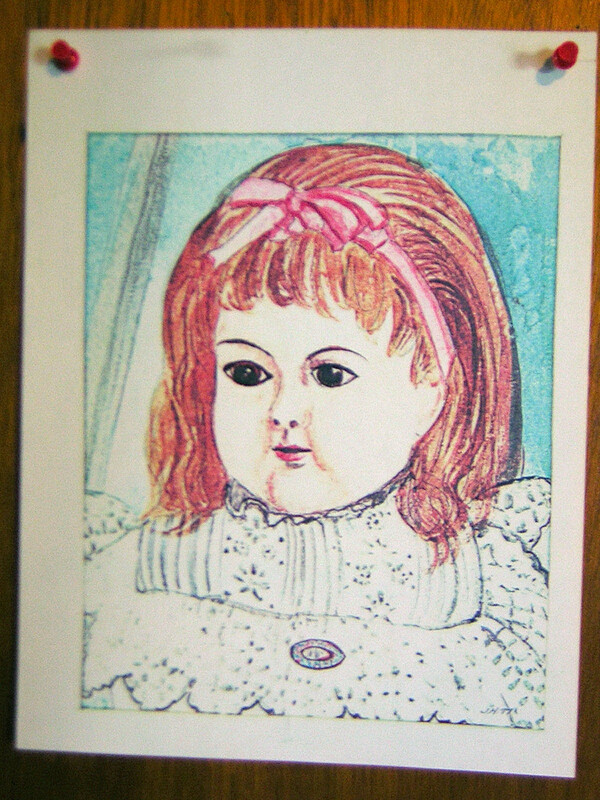 There’s some schlocky ones, some nice ones, some by children… even some by masters like Camille Pissarro. This one was on page 16, lol It’s nice to see how refined and beautiful some of them are; the skill; how far you can go with simple elements. Lots of great ideas and links! “explosion” – collage with newspaper, pencil & pens, 80’s. 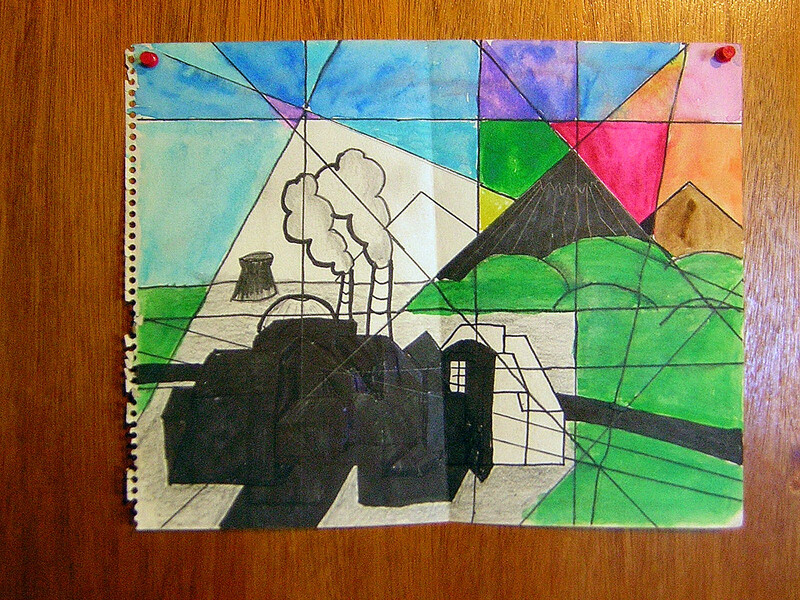 Art class assignment to represent an explosion. 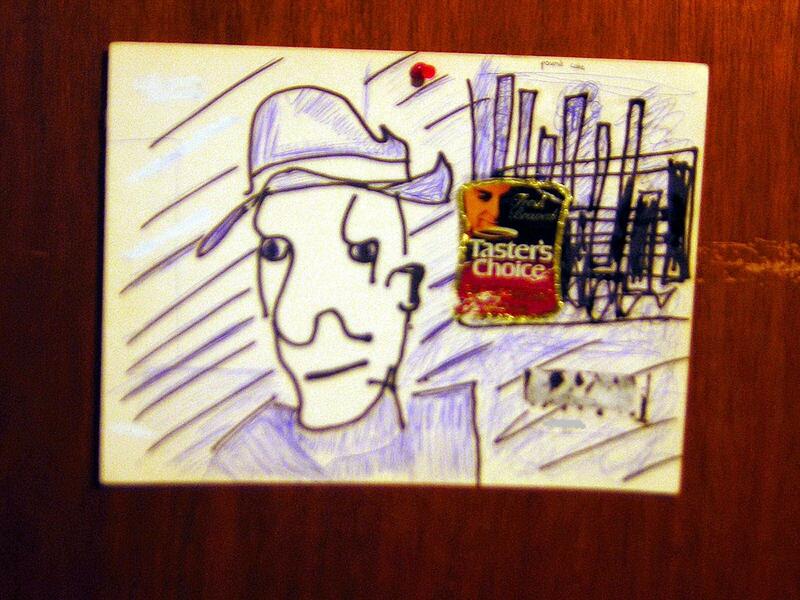 “Burroughs” – collage w/ ballpoint and felt pen, 80’s. A doodle. I didn’t set out to draw Burroughs – it’s just what came out. I like the Folgers Instant Coffee label; it seemed to go well with it. See a brilliant painting of Burroughs here by Roger Shimomura and an excellent article about Roger Shimomura here who did a series of paintings about the racial stereotyping of Asians. One by my sister. My photo is blurred and doesn’t capture the richness & detail. thanks Marga and Karen, hugs! Wow, good to see this side of your talents made visible after many years of not. Thanks for posting.